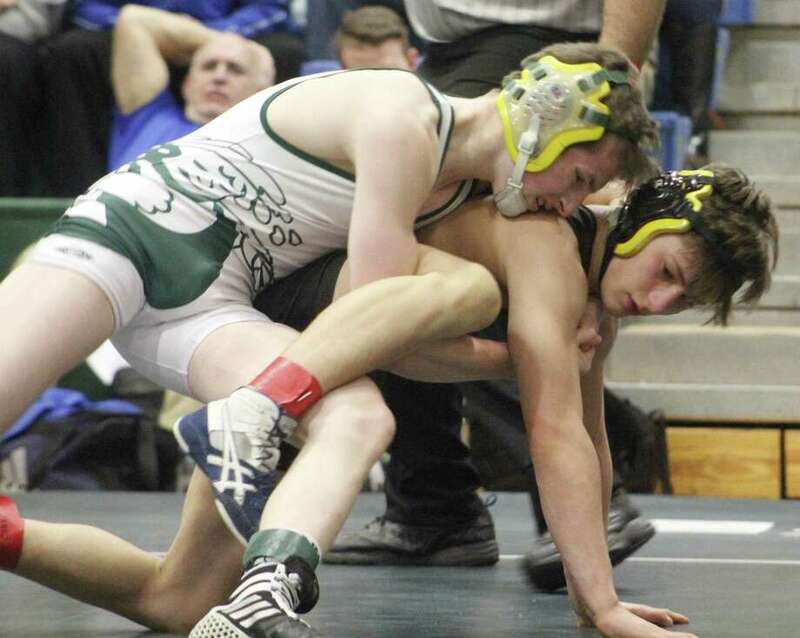 New Milford’s Brandon Leonard, top, and Amity’s Aiden Hebnert wrestle in the championship match at 120 pounds Saturday at New Milford High School. NEW MILFORD — The New Milford High School wrestling team defended its home turf once again. The Green Wave edged Xavier of Middletown by 8.5 points to win the 37th annual New Milford Wrestling Tournament Saturday. The Wave, which scored 182 team points, has won its home tournament every year since 2014, excluding the 2016 tournament, which was canceled because of snow. Xavier took second with 173.5 points, followed by Simsbury with 96.5, Wilton with 95 and Amity with 89. New Milford placed seven wrestlers in the finals and captured five individual titles to score 182 team points. Brandon Leonard (120 pounds), Mel Ortiz (126), Colin Lindner (132), Tyler Schultz (138) and Julian Reza (195) all placed firts in their respective weight classes, while Luke Schell (113) and Kyle Fabich (182) claimed runner-up honors and Michael Haggerty (220) took third. Reza won a 6-4 thriller in overtime in the 195-pound final after scoring a two-point reversal with 1:14 remaining in regulation time to tie the score. Peter Coniglio (113) placed fourth for New Milford’s B team. Bethel placed eighth in the team scoring with 78 points. Nick Cote won a 6-4 decision in the 220-pound final with a two-point takedown at the final buzzer. Max Khoshabo gutted out a grueling overtime battle to win a 3-2 decision i n the 160-pound final. Nick Marchak (152) placed secon d for Bethel, and Eamon Toland Matos (145) placed third. Brookfield’s Richard Mitchell placed third in the 285-pound class. Team scores: 1. New Milford 182; 2. Xavier 173.5; 3. Simsbury 96.5; 4.Wilton 95; 5. Amity 89; 6. Ludlowe 88; 7. Fitch 87; 8. Bethel 78; 9. Wethersfield 69; 10. Weston 40; 11. Plainville 37; 12. Norwalk 32; 13. William Hall 29.5; 14. Notre Dame-Fairfield 28; 15. Portland 20; 16. Brookfield 18; 17. Harding 16; 18. New Milford B 13; 19. Cromwell 2; 20t. LaSalle and Stonington 0. 106: Championship: Ty Finn, Simsbury, won by forfeit over Travis Longo, Wilton. Consolation: Michael Rapuano, Xavier pinned Josue Bobe, Portland 1:31. 113: Championship: Jarod Kosman, Fitch tech. fall Luke Schell, New Milford 22-6. Consolation: Saul Pera, Simsbury, major dec. Peter Coniglio, New Milford 8-0. 120: Championship: Brandon Leonard, New Milford pinned Aiden Hebnert, Amity 2:39. Consolation: Finn McGovern, Wilton dec. Everret Nash, Ludlowe 8-2. 126: Championship: Mel Ortiz, New Milford dec. Nick Rende, Wilton 5-4. Consolation: Matt Laurie, Wethersfield dec. Sebby Soli, Plainville 7-1. 132: Championship: Colin Lindner, New Milford dec. James Lunt, Xavier 6-5. Consolation: Breon Phifer, Weston pinned Trey Harris, Wilton 4:44. 138: Championship: Tyler Schultz, New Milford dec. Zach Taylor, Ludlowe 7-3. Consolation: Michelangelo Bolorin, Wethersfield pinned Grant Barber, Xavier 0:42. 145: Championship: Austin Robertson, Fitch major dec. Luke Tischio, Xavier 12-0. Consolation: Eamon Toland Matos, Bethel dec. Mason Torres 3-2. 152: Championship: Matt Rothman, Amity dec. Nick Marchak, Bethel 7-2. Consolation: Eric Emmendorfe, Ludlowe pinned Alex Hernandez, Plainville 3:55. 160: Championship: Max Khoshabo, Bethel dec. Tayon Simpson, Notre Dame-Fairfield 3-2, OT. Consolation: Alec Arnold, Wethersfield pinned Sam Keylock, Amity 1:52. 170: Championship: Ryan DeVivo, Xavier dec. Zach Zeyher, Wilton 11-7. Consolation: Justin Hathaway, Ludlowe, pinned Will Henery, Simsbury 2:30. 182: Championship: Dylan Sousa, Xavier dec. Kyle Fabich, New Milford 3-0. Consolation: Jackson King, Simsbury dec. Jakari Walker, Norwalk 6-2. 195: Championship: Julian Reza, New Milford dec. Justin Searls, William Hall 6-4, OT. Consolation: Colin Malloy, Xavier pinned Brandon Hamilton, Fitch 3:32. 220: Championship: Nick Cote, Bethel dec. Dakota Grover, Fitch 8-6. Consolation: Mike Haggerty, New Milford pinned Jack Cunningham, Simsbury 1:00. 285: Championship: Justin Griffin, Amity pinned Jameel Salami, Xavier 2:44. Consolation: Richard Mitchell, Brookfield pinned Brendan Farrell, Norwalk 0:56.